Some cats are naturally territorial, especially when confronted with another cat. However when Pocky, a cat in Taiwan, spotted a strange cat staring back at him, he decided to teach this intruder a lesson by attacking it. Of course, Pocky was actually looking in a mirror and attacking an image of himself. 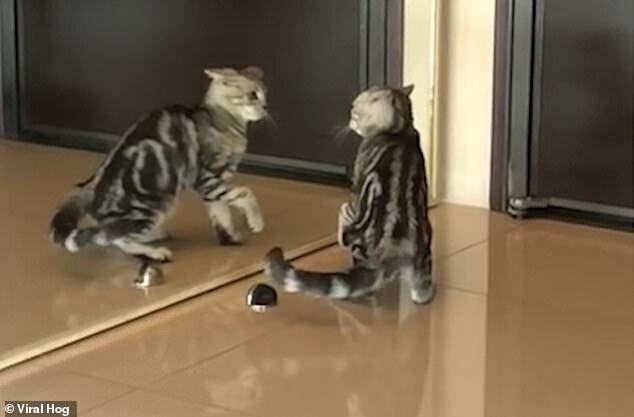 Watching a cat get mad at itself is amusing because watching humans get mad at themselves usually is not (unless those humans also attack their image in a mirror). To watch a video of Pocky attacking himself in a mirror, click here.